A Space to Relax and Refresh was Needed. 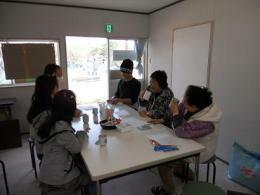 We opened Ochanomi (Tea Break) Café in the common space on the first floor of Volunteer Center Kizuna-kan on April 26th (Tue). “Spending all day with others has become too much for me these days. Hearing these words and recognizing that the evacuees needed a space to relax and refresh, we decided to open this café. While deciding on the opening date, we learned that a flea market would be held in front of Kizuna-kan for one month starting from April 26th. We therefore scheduled the opening of our café on the same day. 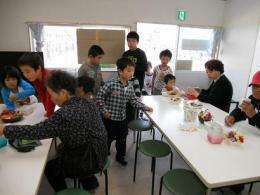 From the evacuation shelter, it takes only a few minutes to reach the café in Kizuna-kan, even if you walk slowly. We offer a set menu of a cup of coffee, black tea, or green tea with some sweets for 50yen. We opened the café at 1:00 PM on April 26th. “I guess it may take a while for the local people to step into this building, since they seem to be rather shy and hesitant to a ccept outsiders. If one customer comes, let’s say OK for today.” I said to myself. Then a woman came by. “How about a cup of tea? We’ve opened a café.” I said, inviting her to step inside. “You have tea? Sure, I’ll come”, she said and came back with two of her friends soon after. After that, people came in one after another. 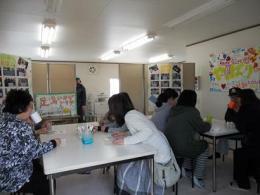 By the end of the first day, 15 people had visited our café. Here are the voices of the people who visited us in the last two days. The volunteers working at the sites also drop by this café. Not only the local volunteers, but also the people from many other places in Japan, like Shizuoka, Nagoya, Toyohashi, Kyoto, etc. have visited us. They talk on various topics; from earthquakes to their own local specialties. This café has become an indispensible part of the relief effort, a place for people to meet, exchange information, and, most importantly, take some much needed time to relax. Reported by Ai URANO, Rescue Stock Yard (based in Nagoya), from Shichigahama, Miyagi, Northeastern Japan. I believe it is important to not only give the people a place to relax as is explained in the article, but also to try and recreate a sense of community and being part of the whole, which this new meeting place obviously does. I think a pleasant atmosphere will facilitate the return of hope and courage. I understand it is run by volunteers. How is the rest funded (e.g. rent for space, beverages)? To carry out such a project, much more efforts are taken for preliminary management since various donors and stakeholders are involved. For this case, the land for the building is rent for free by Shichigahama Town, the building itself is offered by Nippon Foundation, foods and beverages are covered by donation goods from Aichi Co-op, and of course the cafe is run by local and external volunteers. Volunteers are not paid but it costs to transport them to the site. This cost is covered by donation from people. Drinks in the cafe are NOT offered for free (50 yen / 30 cents per cup) intentionally. FREE drinks (or goods) seems sometimes "imperative" to the survivors. I would like to introduce another old woman's voice heard in the evacuation center. "I sneak into the kitchen and cook vegetable bought at the market. I feel really sorry since they offer me free foods everyday." This cafe must be so important to its patrons. It's not only a place for tea and social relaxation; it's a place to mentally recharge. In the transcripts of the patrons' comments, I read a lot of mental anguish. I only hope the sharing of experiences help heal the patrons.